When I was a youngster growing up in a suburb of a blue-collar steel town in northeast Ohio in the 1950s and 60s, I loved summer nights. Let me be clear that the foremost reason for my affection for summer was that school was out. But it was so much more than that, and still is. Sure, summer days filled with warm temperatures, fluffy white clouds sailing by and gaggles of my peers running loose made for riotous times. We’d play ball, ride bikes, and explore for hours on end along the little creek that snaked through a woods down over the hill from our brick bungalow. However, we knew when to come home for lunch and supper, or we wouldn’t eat. It was that simple. It was a crazy, wonderful era to grow up. Times were changing. Right after supper, we watched the world unfold before us on the nightly news on black and white television. I had trouble reconciling what I saw then with what I had seen just before dinner on the Mickey Mouse Club. That might have something to do with why I enjoyed and enjoy summer nights so much. Things got quieter after 10 p.m. or so. The noises of life subsided. I escaped into the refreshing darkness, unafraid, in awe of creation, and in search of anything that moved in the sparkling sky. Since we were on summer vacation from school, my siblings and I were permitted to stay up later. I loved the evening’s coolness, a respite from the daytime heat and humidity. The nighttime air was our air conditioning. I took full advantage of those cooler opportunities. I loved to view the night sky. Streetlights were scarce in our neighborhood then, allowing us actually to see the constellations and the countless stars. My folks must have noticed that interest, too. I got a telescope, and that allowed me to examine the heavenly hosts up close. 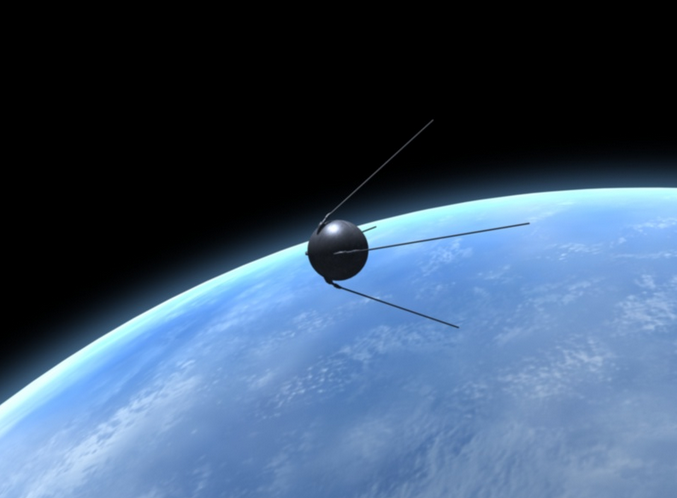 It was the beginning of the space age, and once I even was able to follow Sputnik, the first-ever man-made satellite launched by the Soviet Union. 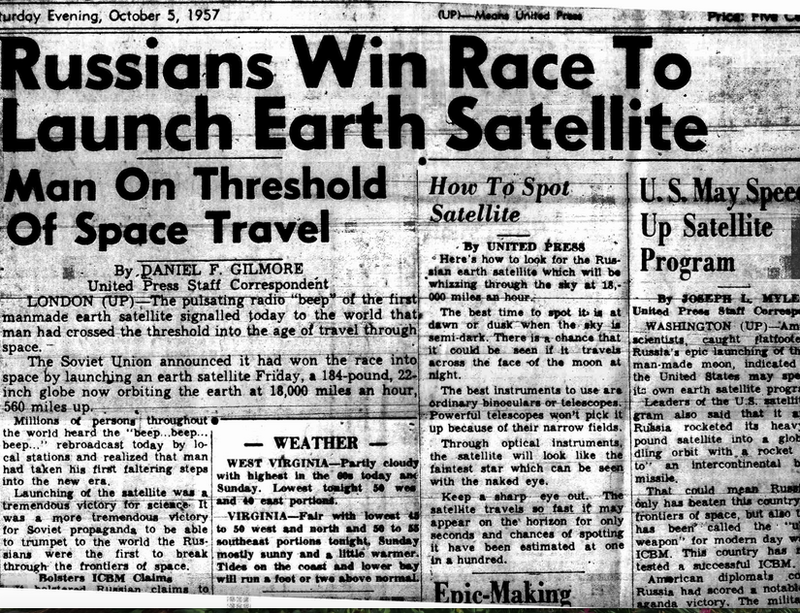 Satellites were still so novel that newspapers published the time and flight path of their orbits. When I saw Sputnik, I couldn’t believe its simplicity, a round ball with four protruding antennae. I liked simpler, natural things, too, like fireflies, the flash of heat lightning in distant storms, an owl hooting. Most of all, I embraced the solitude that summer nights afforded. Here I am decades later, a grandfather instead of a grandson. I still love the quietness of early summer nights, before the crickets and katydids begin their concerts. Living here in the country, I lie awake at night listening to distant sounds far from our home, dogs barking, horses whinnying, and jetliners cruising high overhead. It’s that calm. If I’m fortunate, a Whippoorwill will wake me from my daze, or a pair of coyotes will howl from the hilltop behind our home. An American Robin will startle me awake long before dawn, perhaps herself startled from her nest. Was it a cat, a flying squirrel, an owl, or did one of her babies grow restless and try an early morning fledgling flight? I still like the nights before the crickets start choir practice. I still prefer summer’s air conditioning to artificial. I am most appreciative that lightning bugs don’t crackle when they blink. But wouldn’t it be neat if they did? The little blue house in Boothville, LA where we worked. Living in rural northeast Ohio, it would be easy to ignore the on-going disastrous situation in the Gulf of Mexico 1,100 miles away. But I can’t. For me, it’s personal. 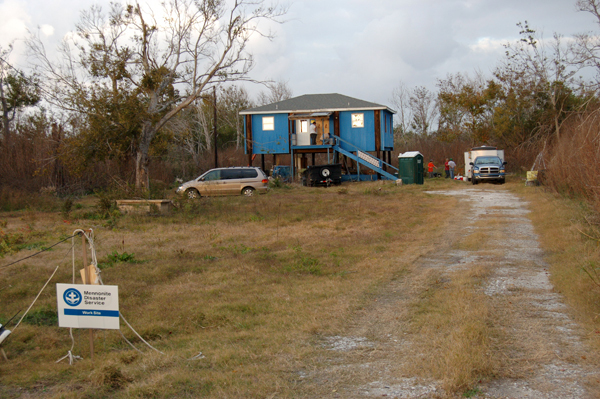 I had spent a week in Plaquemines Parish, Louisiana with a group from Holmes County volunteering to restore a home 18 months after the devastating duo, Hurricanes Katrina and Rita, had wreaked their havoc. We worked through Mennonite Disaster Service (MDS). In the course of our stay and work on Mississippi River Delta, we got to know the native people and their rich, historic interconnection with the delicate environment of the impressive delta. They had lived and worked there for generations. We visited with them in their homes, some of them outside the infamous levies in the watery bayous. Their stories were heartening for us to hear, healing for them to tell. 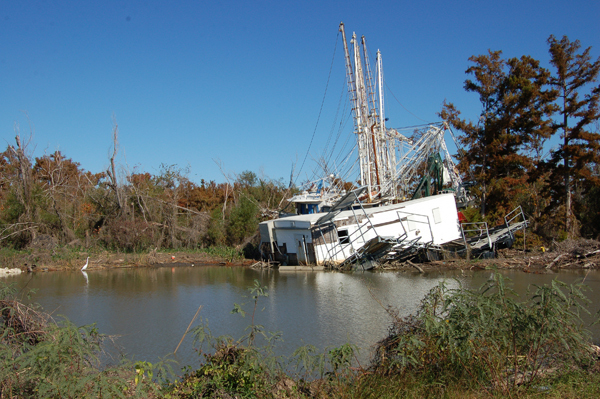 Wrecked boats still sat in inlets and bayous outside the levies that protected the Louisiana delta. The little blue house on stilts where we worked in Boothville was just up the road from Venice, where much of the coverage of the oil disaster has been dispatched. I had found it an eerie place back then. It has to be more so now. Large fishing boats still sat where the winds and waters of the storms had deposited them. Nearby, oil facilities, both inside and outside the levies, continued their hum. Helicopters regularly ferried workers and supplies to and from the offshore rigs. The terra firma there wasn’t exactly so firm. Centuries of silt deposits from the big river squished beneath your feet in places. Outside the earthen levies you risked getting your feet wet with a simple change of the wind, tide or waves. 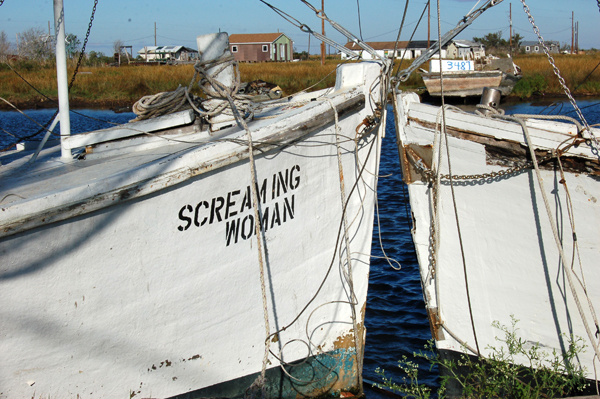 Wrecked and unclaimed boats still sat where Katrina and Rita had deposited them near the mouth of the Mississippi River at Venice, LA. The natives know how critical the preservation of these irreplaceable reeds, rushes, live oaks, reefs, barriers, coves, channels, islands and inlets are to both wildlife and their collective life. The marshes and the people are intimately related. Now those precious wetlands are choked with oil or could be. Wildlife, floral, fauna and livelihoods are all in jeopardy. And we can’t forget those who died or were injured in the original explosion. Most people work in the region’s two main industries, oil or fishing. The fishing industry, which supplies a third of the world’s seafood, had revived following the storms. 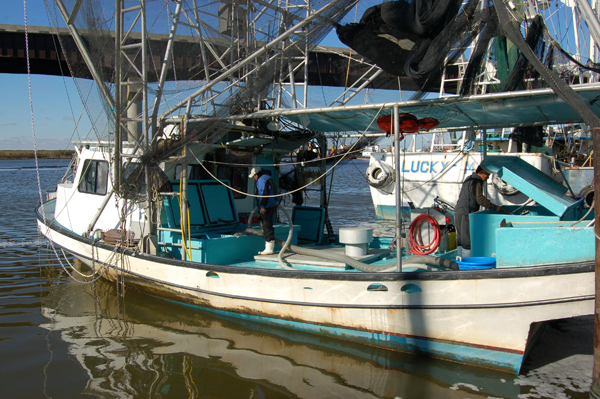 Workers unloaded shrimp on Dec. 1, 2006. Now this unnatural mess seriously threatens all of that. And once again, private and governmental preparations and responses have seemed much too shortsighted and inadequate, if not inept. It was hard enough for these colorful folks with their wonderful Creole accents and marvelous human stories to endure and reestablish themselves after the storms. How would they ever recover from this massive, man-made catastrophe? When I was in the sixth grade, which was clearly a long time ago, a United States map hung at the back of the room. As a distraction from my studies, I used to stare at that map and wonder about the various shapes and configurations I saw represented. I was particularly fascinated with this strange, green feature dangling down from the rest of the continent into the blue Gulf of Mexico. My teacher said it was a delta formed by the unending accumulation of sedimentary river deposits. As long as the Mississippi carried silt, the delta would always grow. I know I have aged a lot since then and my memory isn’t what it used to be. However, I don’t remember seeing a giant, black stain on the map where the river met the Gulf. But there is a real one there today, and it makes me sadder than sad. 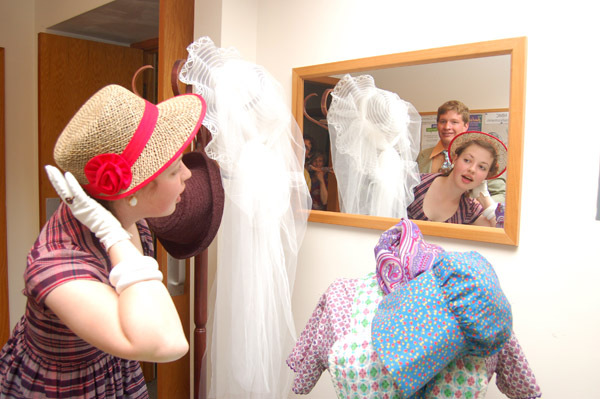 Naomi Raber checked her hat before making her entrance into the fashion show. A fashion show sponsored by a thrift store sounds like the punch line to a bad joke. But that’s exactly what happened recently in Millersburg to the delight of all who attended. Save and Serve Thrift Shop of Millersburg sponsored a memorable event titled “Tipping the Teacup” Friday evening, May 21 at Millersburg Mennonite Church. Part meal, part fashion show, part fundraiser, the enjoyable gathering was officially dubbed “a very special tea party and style review.” No matter how it was described, the evening became quite the social party. Helen Glick, assistant manager at Save and Serve, organized and hosted the party, which was attended by nearly 150 people. That number included 23 individuals, children to grandmothers, who served as models for the fashion show that followed the heavy Hors d’ Oeuvres meal. The church was filled with decorated tables set with china plates, teacups and saucers, all from Save and Serve. Bouquets of fresh cut flowers adorned each table. After raiding a buffet worthy a cruise ship and having tea or coffee served to them, attendees were entertained while they ate. Rhoda Mast played the piano and sang. Others sang as well, including Kudzayi Nyakura, Rachel Miller, and Annie and Carrie Yoder. After the meal, the patrons, who paid $20 each to attend, settled in for the stylish entertainment. They weren’t disappointed. Carol Mullet of Sugarcreek served as commentator of the style review. Each volunteer model dawned pre-selected outfits obtained from Save and Serve’s inventory and wound their way through the audience as Mullet described their choice of clothing. 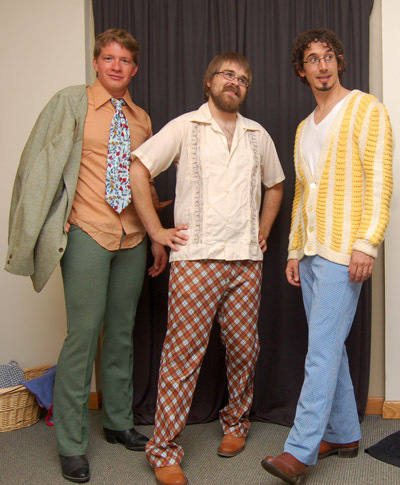 Zack Miller, Kevin Roth and Jonathan Reuel revisited years gone by with their outfits. The wardrobes modeled ranged from prom dresses to hip garb to head-to-toe cowboy. Each model chose three separate outfits to wear. Some wore exquisite clothing, while others exhibited crowd-pleasing silliness with combinations from by-gone eras. 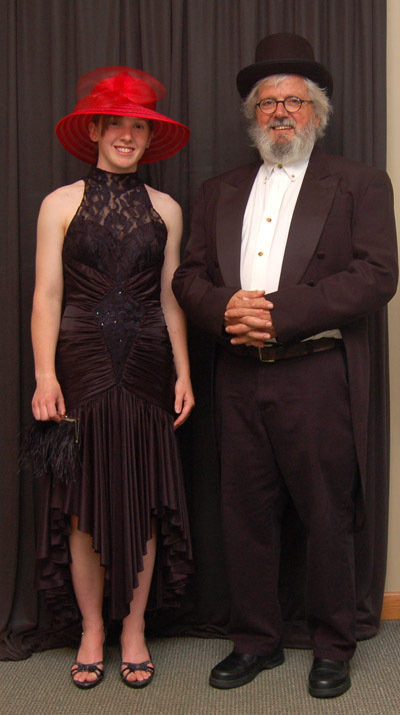 The style show concluded with entrance of a black tuxedo complete with top hat worn by Dr. Roy Miller. He escorted Heather McDonough dressed in a lacy, black formal gown and contrasting red hat and veil. All the models had first option to buy the clothing they wore. After that, those in attendance could purchase particular items they had spied. Glick said the evening earned nearly $2,400 for Mennonite Central Committee (MCC). Proceeds from Save and Serve also are sent to MCC, which aides refugees in need of food, clothing and shelter around the globe. Emergency kits for Haiti following the devastating earthquake there earlier this year are an example of MCC’s services. The Tipping the Teacup planning committee included Glick, Mullet, Janice Miller and Ruby Miller. This was the second year for the benefit fashion event. Formal attire completed the benefit fashion show. It was a gorgeous morning for what my son and my wife had conspired to do. The project itself was both practical and uncomplicated. Of course, they needed me as the gopher, as in go for this and go for that. As it turned out, I will remember that beautiful morning for a long, long time. 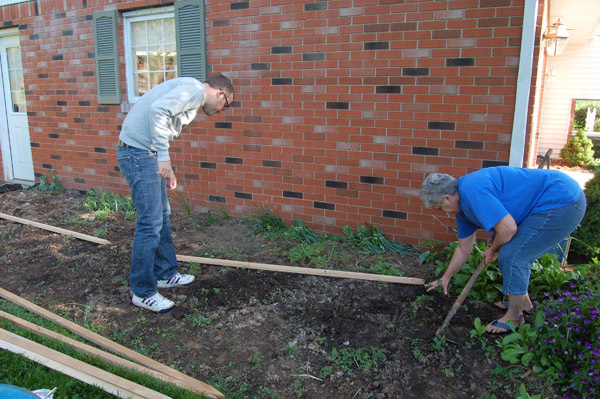 Our son came to help build a pair of tomato trellises, since we will share the eventual bounty with him and his wife. My wife had found a magazine picture of just what was needed for our heirloom tomatoes. Last year, the heirlooms flourished. But as the blossoms turned into baby tomatoes then plump fruit, the plants gave way to gravity even though they had been staked. If we didn’t get the tomatoes before they hit the ground, the dry rot did. The main problem was that the tomato patch quickly became a vegetative jungle. It was difficult finding the ripe ones that hung hidden in the leafy overlap. That problem needed to be remedied if our two families were to fully enjoy the fruits of our labors. My son and my wife readied the site for the tomato trellises. The proactive plan seemed simple enough. 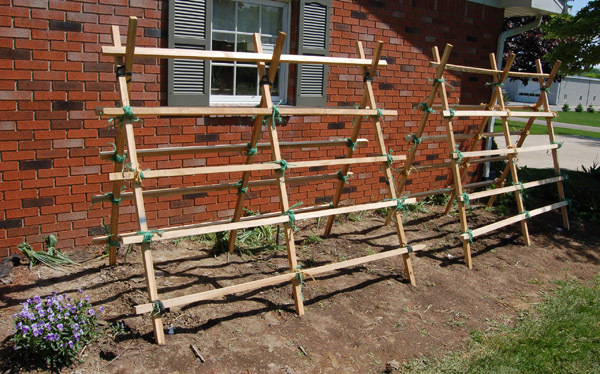 The growing tomato plants would be safely tied to the wooden trellises, which would better distribute the weight than the previous individual supports had. We had the perfect place to erect them, the south-facing plot next to our bricked garage wall, the scene of last year’s prolific patch. The needed materials as shown in the picture were easy enough to come by. My wife had already obtained the sturdy oak stakes. I retreated to the neighbor’s farm for baling twine. Using a measuring tape and a container of flour, the experts measured and marked where the supporting sets of three stakes each would go. 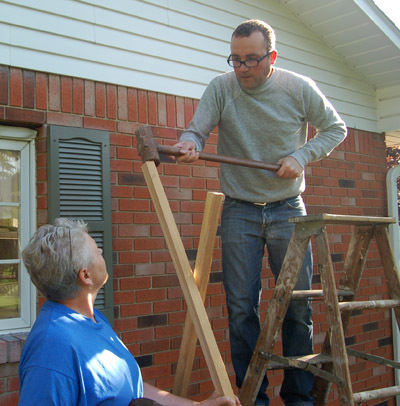 Our energetic son climbed the stepladder with sledgehammer in hand, and the seven-foot posts were pounded into the fertile ground at an angle so they crossed near the top. Not wanting to look too professional, we just eyeballed the angles. After each set of stakes was thumped into place, we attached the crossbars, again three on each side. We secured them to the stakes by crisscrossing lengths of twine around and around and tying them off. I think I can tie square knots in my sleep now. 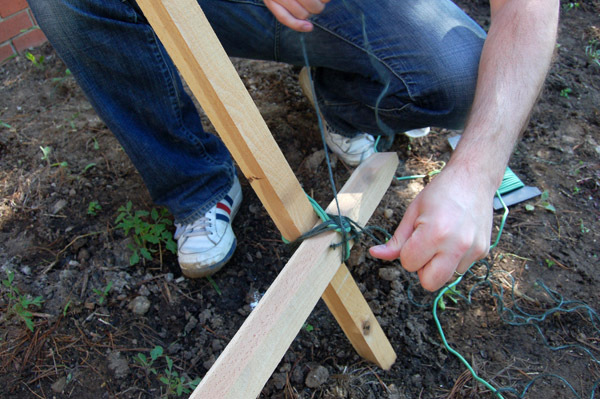 Baling twine was used to secure the horizontal and vertical stakes. Each bar was leveled in place. A top bar, which according to our son was purely for looks, was laid in the cradle of where the angled stakes intersected. Our son pounded in the stakes that formed the trellises. Once the first trellis was completed, one would think the second would go easier. Somehow that didn’t really happen. Still, it turned out all right, just a little off skew. The tomatoes won’t care. In the process of all this measuring, climbing, pounding, angling, leveling and tying, we threw in a little kibitzing as well. You know how mother, father and son, and husband and wife can be. Personal, profound, picky, sarcastic, vulnerable, venerable, loved. 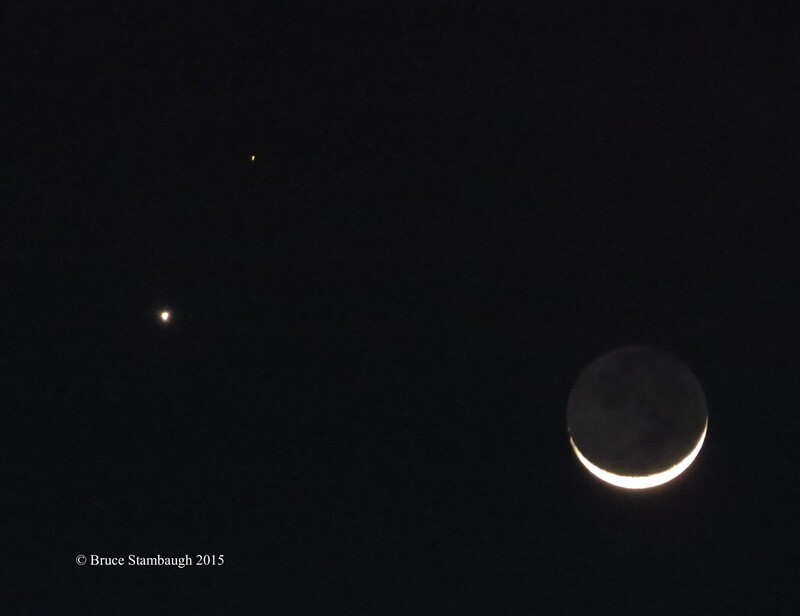 This constructing trio was all that and then some on this lovely morning. 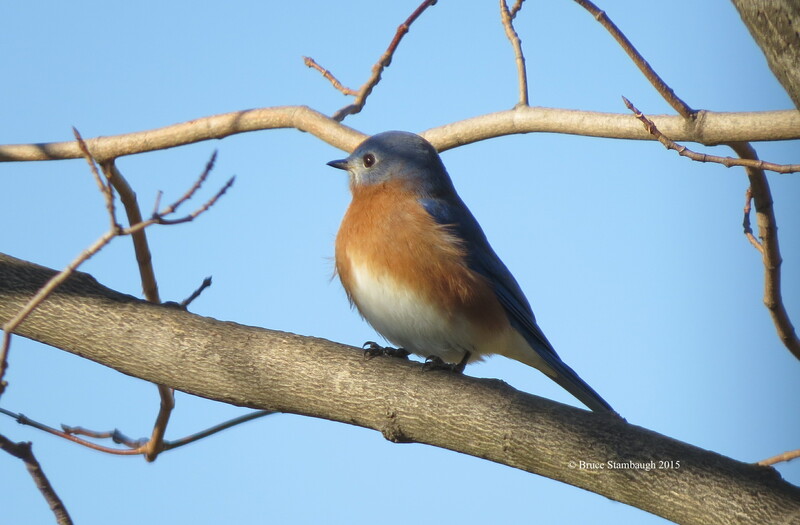 While we worked beneath a cerulean sky, robins, nuthatches, house wrens and blue birds called and fed and gathered nesting materials all around us. Building anything isn’t exactly my strong suit, unless it’s memories. Indeed, this morning well spent fit that definition like a gardener’s glove. In truth, we had built more than tomato trellises. Creating productive, valued, lasting recollections with family seemed a most appropriate way to prepare for Memorial Day. Come late summer, when the heirlooms are heavy laden but securely ripening, memories of a different flavor will be made. The completed tomato trellises stand against the garage wall. 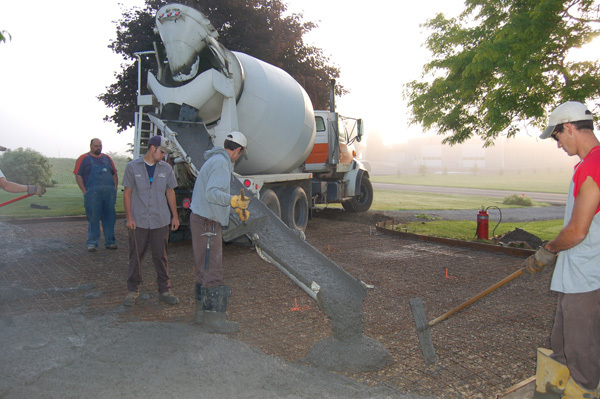 Our neighbors, who own Mast Poured Walls, pour the cement for our parking pad. I can’t say for sure if the idling engines woke me or if I just happened to notice the noise after a full night’s sleep. No matter. Their steady, pre-dawn purring was merry music to my ears. Both neighbors across the road own a construction-related business. One pours walls for a living, the other trenches fields and lays pipe. Their tidy steel buildings sit cattycorner from my home, one to the southeast, and the other to the northeast. On mornings when they work, they often pull out their always-clean vehicles and let them idle before heading out to the job site. It doesn’t take a financial wizard to guess that their work, like most building related work, has slowed considerably in this extended recession. Though neither has ever complained to me, my neighbors’ patience for work has had to replace actual labor. This lack of employment has been hard on them, not just financially, but emotionally, too. These men are used to working hard for their daily living. But in this economy, with construction moving at a snail’s pace, regular, substantial work has waned. Last year was especially uncertain. Too many days their trucks were silent. It may sound funny to say this, but I missed that motorized humming and the occasional sharp clanking of metal against metal as they prepared to head out. I felt their pain. The expressions on my neighbors’ faces couldn’t hide their concerns. They were frustrated at the lack of work. These are talented men, men who know how to put in a decent day’s work for honest pay. Unfortunately, it wasn’t just my good neighbors whose jobs had slowed or stopped altogether. It seemed every business took a hit, regardless of occupational focus. In a community where work ethic is king, doing nothing or next to it was absolutely agonizing. 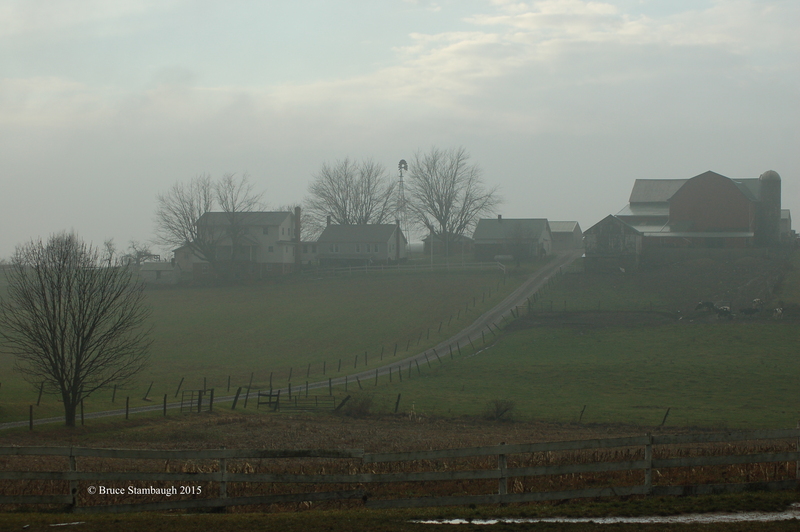 The economic downturn was particularly hard on this community that hosts the world’s largest concentration of Amish and Mennonites. Consequentially, the tourist industry, a major revenue producer for private and governmental institutions alike, tapered off. It was difficult to see people’s work hours curtailed. A few businesses simply closed for lack of customers. For the first time in a long time, our rural area felt what the rest of the global economy was feeling. And it hurt. Farmers weren’t immune either. While milk and commodity prices sputtered, operating expenses kept rising. It was a losing proposition. For these thrifty people with whom I have communed daily for four decades, it wasn’t just about the money. Cash flows were low, and so were their spirits. These were people who knew how to work, had excellent skills, many self-taught, and labored for a fair wage. They had done so all of their lives, as had their fathers and mothers before them. Work was as much tradition as it was means. But true to their congenial nature, their heritage and their commitment to faith, family and community, my neighbors in Big Prairie, Nashville, Glenmont, Killbuck, Clark, Farmerstown, Walnut Creek, Winesburg, Mt. Hope, Benton, Holmesville, Millersburg, Berlin and yes, even charming Charm preserved. They skimped along as best they could, and hoped and prayed for the best. Perhaps we are not completely out of the economic woods yet. But it sure is nice to wake up to the sound of diesel engines running once again. Here’s hoping they keep on purring. We found this nice assortment of morels "in the woods." This time of year, where two or more are gathered together in the world’s largest Amish population, there is certain to be a conversation about mushrooms. Not just any old mushrooms either. We’re talking morel mushrooms, commonly referred to as sponge mushrooms. They can be gray, yellow, brown and even black. Regardless of hue, they’re all good as far as I’m concerned. After all, once you taste your first morel, you’ll realize they are better than ice cream. That might be because they are harder to find than ice cream. You can’t just go to your local grocery story and buy a pound of nicely packaged morels. Finding them takes effort. Instead of talking about finding mushrooms, a friend, my son and I put our words into action. We went in search of the elusive, edible fungus. Everyone has their favorite spot to hunt mushrooms. Usually, it boils down to where they were found in previous years. In our case, we headed up a steep hill and into the woods. For the record, it’s a morel sin to ask exactly what woods. We walked carefully over the spoil bank where my foody son picked wild garlic, across a lane, and down a slope to a deer stand that guarded a placid, clear stream. However, at some point prior to our arrival, the creek had been angry. Rocky, silted debris littered the grassy flats where I had found the largest mushrooms last year. Pretty pink lady’s slippers took their place. We gingerly made our way through the tangles of downed trees, briars and undergrowth. We headed back up hill, into large sandstone boulders covered with delicately textured lichens and mosses. The last of the spring beauties still blossomed here and there in the sunlit woods, still without its canopy. The woods grew thicker, the trees taller, and the forest floor more densely laden with last year’s leaves. Emerald patches of new life broke the brownish camouflage. May Apples, lovely lily of the valley and occasional flowering trilliums made refreshing appearances. I wandered ahead of the others until a pair of unidentified birds winged overhead. 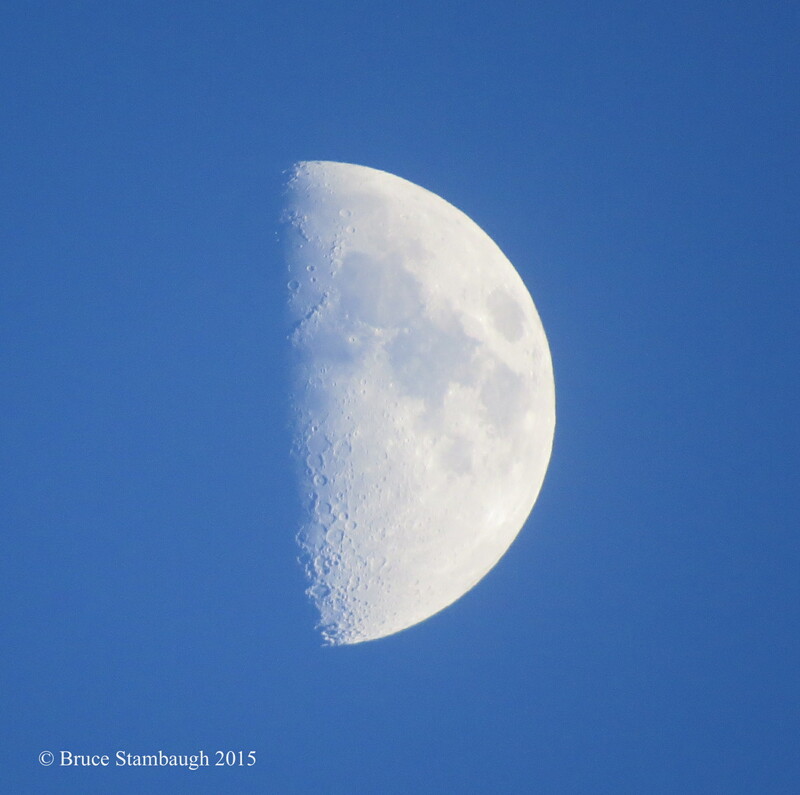 Without binoculars, I struggled to identify them against the late afternoon sun. The birds flew off, one after the other. I looked down, and there against an ancient and fallen, moss-covered elm was my first morel of the season. Before I bent to pick it, I looked all around for others. Mushrooms seldom sprout solo. But this decent gray was the exception. I hollered to my partners, who were out of sight but within earshot. My shout was promptly returned. They were less than 100 feet away, on hands and knees carefully scouring for mushrooms. I circled around and joined them. I sat on the leafy debris carpet, straining to find more. Soon I spotted one, but when I reached to pick it my son shouted again. My hand was about to crush another mushroom. That’s how hard these little fellows were to see. As the even sun faded, woodpeckers still hammered out their territories. After three hours, we heeded their reverberating warnings and retraced our steps. In all that time, we had covered less than a mile. But the season’s first mess of mushrooms was in hand. 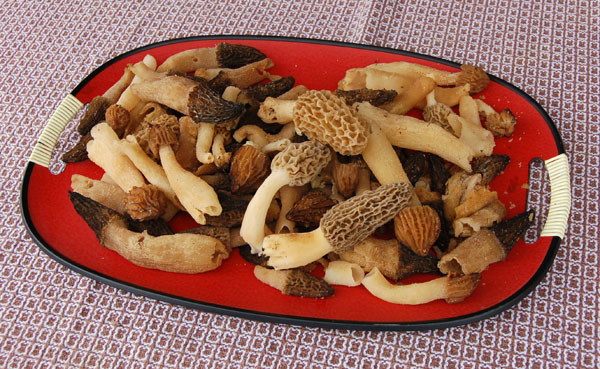 Not many, but enough for a luscious meal of the hearty, flavorful morels. Just one taste of these sautéed morsels made all the effort worth it. I tell myself that every spring when the talk of hunting mushrooms in Ohio begins anew. My mother gave me an early Mother’s Day present this year. I know. It’s supposed to work the other way around. The gift presented itself in the evening of one of our incredible summer-like spring days we’ve had recently in rural Ohio. I had gone to have supper with Mom at the assisted living facility where she lives. After the meal, I pushed Mom’s wheelchair down the hall towards her room. Since it was still nice outside, I asked Mom if she wanted to go out on the porch awhile. I pretty well knew her response would be positive. We settled on the southwest corner of the wraparound porch. From there, we had a panoramic view of the broad, bucolic valley below. We could see far to the east, south and west. The evening sun was still strong, its breeze just a whisper. Mom and Dad used to spend as much time together on the porch as they could. From their elevated position high on the hill, they had a lot to take in. Together they enjoyed watching the progress of the construction of a covered bridge the county erected over a usually gentle stream. 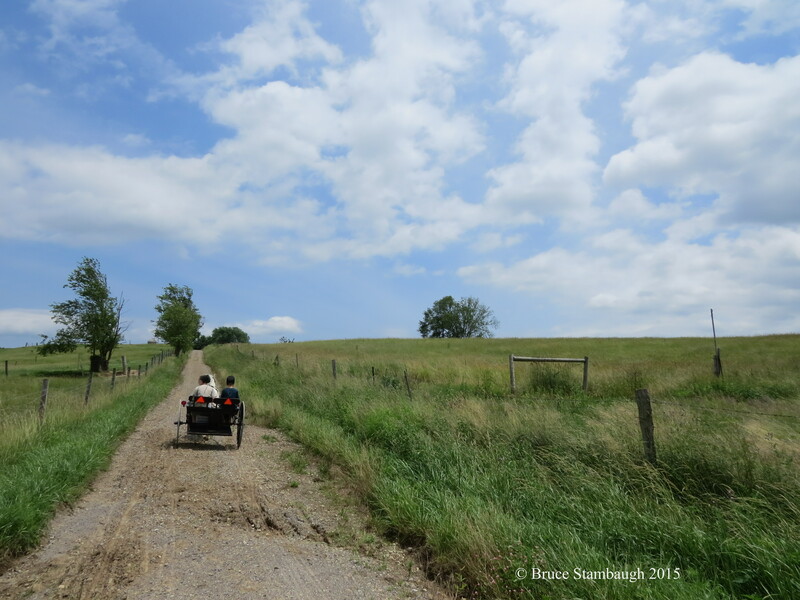 They could see Amish farmers mowing hay in the flat, fertile fields on either side of the creek. They watched the traffic on both the county road that climbed the long hill into the little town of Walnut Creek and on the state route that bypassed both. They preferred the buggies plodding up the step grade to the rumbling trucks on the highway. With Dad gone now, it was up to us family members and staff to encourage Mom to take advantage of evenings like this. Her Alzheimer’s disease prevented her from even initiating the idea. But if somebody else suggested it, she was all for it as long as the weather cooperated. This fine evening was downright perfect. Besides the temperature, the earth vividly declared its beauty, much like the many landscapes Mom had painted over the years. She no longer paints, but her appreciation for both nature and her own natural affinity for appealing colors remain. She still picks out her own clothes to wear each day, and receives many compliments on her color coordination. Mom hasn’t lost her artistic eye, either. At first, she didn’t say much as she gazed over the vibrant scenery. Eventually, she began to point out the various flowering trees, all at their peek. 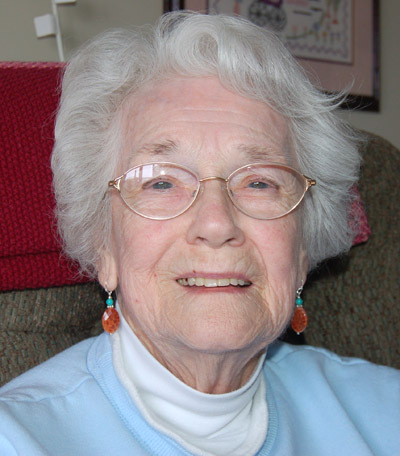 And she did so in complete, spontaneous sentences, something her disease has greatly diminished in this lovely lady. Long, comfortable silent spells punctuated our conversing. We listened to bluebirds warble their blissful songs. Cardinals called. Song sparrows sang echoing solos. Mom asked me what those yellow things were far off in the distance. I asked her if she meant the objects with the silver, pointy tops. She said, “Yes,” as she pointed with her finger. I told her those were corncribs like Uncle Kenny used to have on his farm. Soon a green four-door sedan, exactly like the car Mom and Dad had before we sold it recently, pulled from the parking lot below us. Mom watched the car travel all the way out the drive. She turned toward me and instead of saying, “That looks like our car,” Mom surprised me with an even greater upbeat comment. “I wish I could still drive!” she said with a fantastic smile. For me, Mom’s moment of recognition and effusive expression was an unexpected and unforgettable Mother’s Day gift. As I push into my 60s, I’m having the time of my life. At home, at work, at social and church functions, community gatherings, I enjoy the people I’m with. But as I take advantage of the senior citizen discounts, I am also more than cognizant of my current station in life. Being an active member of the Sandwich Generation, I never know what any particular day will bring. Some days are filled with excitement and anticipation. Like when our daughter informed us that her family will be leaving Texas and moving to the Commonwealth of Virginia. My wife and I were thrilled. Come June, we will be just a short six-hour drive away from our precious grandchildren and their equally precious parents. It will be a whole lot handier to spoil the grandkids in Virginia than Texas. However, there are days when I really don’t want to answer the phone, fearful that a relative or friend has incurred some catastrophe. I consider myself to be a positive thinker and an equally positive person. But as life’s varying circumstances unfold, the chances for bad news seem to increase the older I get. My mother and mother-in-law both live in the same assisted living facility. When its phone number appears on the caller ID, ambivalent thoughts race through my mind. Is a nurse calling to say that my mother is ill or my mother-in-law has taken a tumble? Both have happened. However, more often than not, it’s simply my mother-in-law calling with an inconsequential question or to share some special news. Too much unpleasantness has happened to family and friends that has trained me to be cautious. I know I am not alone in having these apprehensions. My peers have confessed the same fleeting fears. The unpleasantry can be as variable as the wind. You never know what direction or with what force it will hit you. My older brother and his family had looked forward to a tour of Italy. They had to cancel it last year when both my brother and his wife each had their separate, serious health issues. They rescheduled the trip and were anticipating a sunny and fun-filled time together. Then the volcano in Iceland let loose, and like thousands of others, their flight was canceled due to the huge ash plume that covered Europe. They returned home doubly disappointed. About the same time and only hours after her husband had left for his new job in Virginia, our daughter had emailed us that their neighbor, a man I considered their surrogate Texas grandfather, had died. I truly wanted to jump on a jet and parachute into their backyard. In actuality, I knew there was little I could do in the flesh. We asked how we could help, but some things in life are beyond human intervention and control. That is both the reality and mystery of life, not just for my family or people I know. It is the way of all creatures great and small. Some days are glorious and exhilarating. Others are dark and perplexing. They are devoid of anything even resembling fun, although the sun may be shining brightly. As I enjoy the benefits and honor of being a husband, father, son, brother, grandfather and friend, I am aware that life has both its alphas and its omegas. At this point in my life, I try to remember that every time the phone rings. I normally don’t sleep in, especially until 8:30 a.m. But this morning, I had good reason to do just that. I had filled the previous day with a tightly packed set of eclectic but necessary events. I had played father, son and holy terror all in the same 24 hours. All of which wore me out enough to sleep like a baby for once. Ironically, my busy day started earlier than I had planned. I had a fitful sleep that startled me wide-awake at 4 a.m. Consequently, I awoke for my big day tired before it had officially begun. That’s not a good way to start. Fortunately the evening before I had set out some of the items I needed for a morning presentation. I had also made one of my dreaded “to do” lists with each of the places to be and times to be there. Unfortunately, I lost the list after the first stop. That really was inconsequential since I had the day’s string of activities etched in my brain. I just hoped that no major unforeseen circumstances would derail my day. None did. At 9 a.m. I met with the genial senior group from my church that gathers monthly. I had been asked to co-present about the Honor Flight on which I had accompanied my father as his guardian last fall. Another veteran and his guardian shared about their recent, extra-special Honor Flight that HBO had sponsored for World War II veterans from the Pacific campaign. The emotional sharing went well, and I was off to an 11:15 a.m. doctor’s appointment 15-miles away. I got in and out of there in time to meet my mother for lunch at her assisted living facility. I enjoyed both the good food and conversation with Mom and the other ladies at her table and then was off to my next appointment. But first I had to play like Superman. Only instead of ducking into a phone booth and donning a cape and leotards, I changed into sweats and a T-shirt in a bathroom for my physical therapy session five miles away. Careful not to exceed the speed limit too much, I made it just in time and the painful but productive half an hour went by quickly. Next I zipped to the pharmacy to pick up some prescription renewals. I arrived home right on schedule, which allowed me some unexpected down time. In preparation for the evening ahead, I took a catnap, something not on my lost list. At 4:30, I headed to Cleveland to attend my first ballgame of the season. On the way, I picked up my son and a long-time friend. Thanks to a combination of light traffic and my heavy foot, we were inside the ballpark with time enough to chow down before the first pitch. The camaraderie among us was marvelous. My son and my friend reconnected, discovering mutual interests and acquaintances. Other than the outcome of the game, it was a most pleasurable evening all around. However, after dropping them both off, I realized just how exhausted I was as midnight approached. I fended off drowsiness down the homestretch and silently rejoiced when I pulled in the driveway. I finally hit the hay long past my regular bedtime. I was exceedingly glad I had slept in, but not half as glad as I was for the day’s gracious people and smorgasbord of events that had worn me out.